(August 17, 2005, Vancouver, B.C.) 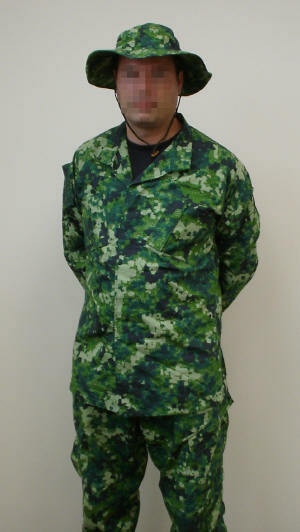 After being commissioned in 2003 by His Majesty, King Abdullah II of Jordan to develop the advanced digital KA2 camouflage pattern for the Jordan Armed Forces, Police, Customs and Counter Terrorism Battalion, HyperStealth Biotechnology Corp. has quietly been involved in developing a number of other countries digital patterns after it was determined with objective results that the pixalated effect of digital camouflage was more difficult to detect than traditional (analog) camouflage. These development programs usually remain quiet unless the trials are photographed or graphics are obtained and disseminated through the internet. Other programs go through trials, approval, purchase, issue and field use by Special Forces with no public dissemination unless the uniform is spotted by reporters who can't identify a pattern. With new cellular phones and PDA's with built in cameras, no longer are these advanced patterns easy to hide from the general public. 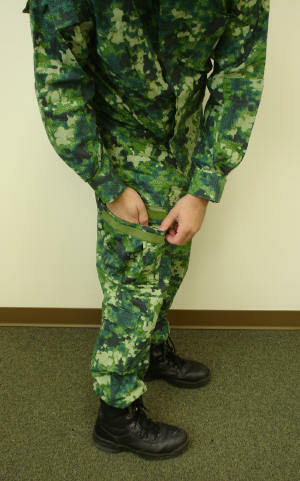 The latest digital camouflage pattern - SpecAm™ images were recently released on the internet and this has provided HyperStealth permission to elaborate on the unique design. SpecAm was designed from natural leaf formations as a scalable fractal (feedback loop) to both blend and disrupt the user from the adversary. With animal concealment, camouflage is either a blend or a disruption pattern - not both. 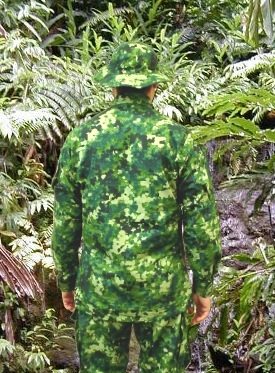 Most military camouflage until the 1990's had the same traits of one or the other. 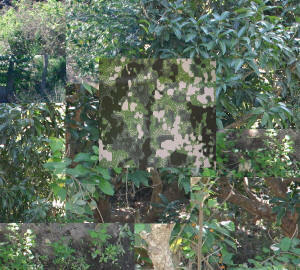 As digital patterns began to emerge, this blending with natural background noise was foremost and disruption was thought to occur with color choices, micropatterns (pixels) were effective in the blending but the larger macropatterns (blotches) were not large enough to effectively disrupt the human symmetry at tactical distances. KA2 addressed this oversight with a larger macropattern to allow for better blend and disruption. SpecAm uses both colors and fractal design to both blend and imitate natural depth and disrupt the outline of the user. The photos on this site are of the SpecAm Tropical color scheme (color differences are due to different lighting conditions). 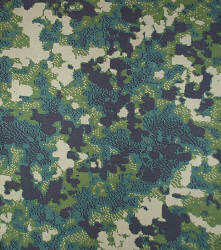 There is no black in this pattern, instead a very dark green was used to meet the no black requirement. A broad analysis of tropical environments showed the most predominant colors to be green rather than brown. A 25 year veteran (ret.) of the U.S. Army Green Beret's had also suggested that brown was not a good color for camouflage in tropical environments as the domestic soldiers in Southeast Asia could identify the brown color on the U.S. soldiers camouflage. SpecAm was developed as an advanced digital pattern which has some characteristics of analog patterns but is actually purely digital in development. The overall design is actually made-up of one of the most complex micropattern digital matrixes (small digital pixels) yet developed. The Microelement of this pattern (left), the "Matrix", is what makes it so unique. When the Canadians designed CADPAT (Canadian Disruptive Pattern) the initial design was made up of similar sized squares. The U.S. Marines modified this into both squares and rectangles for MARPAT of varying sizes, this modification is favorable in most digital patterns. When the SpecAm pattern was changed with that modification it actually hindered the pattern, so the original square pixel matrix was redone. The users refer to this as the Salt & Pepper effect. This term Matrix was used to represent this style as there appears to be a structured order to the micropattern, unlike CADPAT and MARPAT when seen close-up. What usefulness does this micropattern add to the overall pattern at tactical distances? The SpecAm pattern matrix adds an element of color blending so the brain interprets many more than four colors at a distance. The matrix shading adds an element of virtual reality that allows the pattern to be more inconspicuous than would a pattern without these features. SpecAm Alpha series uniforms in this color scheme is now available to Pre-order from HyperStealth. These patterns are copyrighted ©2004 HyperStealth Biotechnology Corp., All Rights Reserved. Patterns may be licensed only with permission. This page and information © Copyright 2005, HyperStealth Biotechnology Corp., All Rights Reserved.